You cannot scroll through Instagram without finding videos featuring strange skincare products. Trends such as 24 karat gold and bubble masks have been catching storm on social media for several months. It also isn’t uncommon to find retailers such as Sephora catching onto the latest skincare craze. We’ve curated a short list on some of the strange skincare trends that are worthy of trying out. Whether you decide to give into the craze or pass is up to you! Remember peeling glue off your hands in elementary school? Charcoal peel-off masks are a similar concept, but with useful benefits. Charcoal masks have become increasingly popular with brands such as Boscia and GlamGlow creating their respective products. The masks aim to clear out pores by removing any blackheads or whiteheads. To use, simply apply the mask, leave on for approximately 10 minutes and peel off the mask. Nothing feels more satisfying than peeling off a mask and clearing out residue on the skin. Snail mucous is a popular skincare trend in South Korea claiming anti-ageing and moisturizing properties according to recent studies. Snail mucous includes ingredients such as peptides and hyaluronic acid which can be found in many beauty products. Many Asian spas it as a part of facial treatments going up for as much as $250. Some spas use live snails on customers’ faces for deeper treatment and exfoliation. Studies have shown that algae have very good cosmetic benefits. Its minerals moisturize deep into the skin and can reduce irritation from acne. Many luxury beauty companies such as Esteé Lauder and Elizabeth Arden are catching onto the trend. You can find algae in many beauty products including face masks and creams. Many social media influencers have featured a skincare product featuring 24K gold at one point. Gold in skincare has been said to trace back to Chinese and ancient Egyptian civilizations where the rich crush gold and incorporate it in daily skincare routines. It was rumored that Cleopatra used gold masks to preserve her youthful beauty. Many luxury spas offer gold treatments which claim to help the skin restore its own collagen. Charcoal bubble masks are not only beneficial for your skin but are a fun way to skip the time while waiting for your mask to dry. 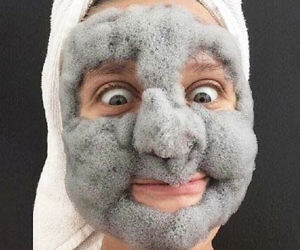 Simply apply the charcoal mask, wait for 10 minutes and watch it inflate like a cloud. The masks are fun to apply and share on social media, especially with friends. Ann Marie Elpa is a second-year student at Victoria College at the University of Toronto St. George. She majors in both English and Book and Media Studies, hoping to pursue a career in journalism. Apart from being involved with the HerCampus team, Ann Marie currently serves as the Vice President of Communications and Alumnae Chair of Alpha Omicron Pi's Beta Tau Chapter and has bylines in The Odyssey, The Newspaper and The Varsity. Ann Marie is also a fashion intern at No Basic Girls Allowed Magazine, a digital blog under Vice Media. She is a self-proclaimed squirrel aficionado and makeup enthusiast.